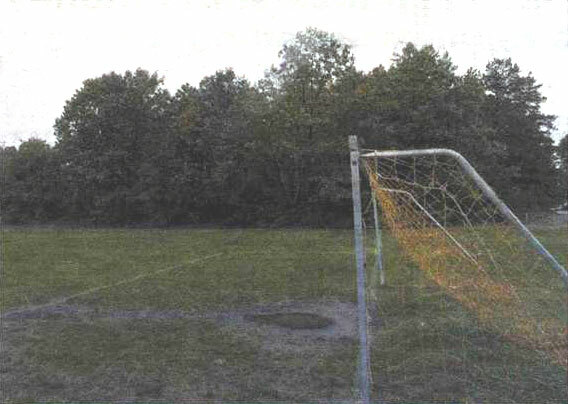 The forest adjacent to Northeast School 's athletic fields in Vernon was sold by St. Bernard Church for a condominium development. VERNON — Amid increasing financial pressures, St. Bernard Church has sold 10 acres along Route 30 to a developer for $1 million. The church last month completed the sale of the land at 75 Hyde Ave. to J.H. Scelza Inc. of Newington, according to town land records and Town Clerk Bernice K. Dixon. In July, J.H. Scelza received permission from the Planning and Zoning Commission to build 76 condominium units on the site. The land had previously been set aside for expansion of the St. Bernard cemetery, which is behind the property, said Leonard Jacobs, the lawyer representing J.H. Scelza, during a commission meeting in July. The land had also been considered as the potential site for an assisted-living home, but those plans never materialized, Jacobs said. The land borders the Northeast School property to the west and the Tolland line to the east. Several telephone messages left for the Rev. Timothy Valliere, pastor of St. Bernard Church, and pastoral council Chairman Brian Kenny, seeking comment on the sale, were not returned Tuesday or today. According to the minutes of the St. Bernard pastoral council's Sept. 20 meeting, the church will net slightly more than $893,000 from the sale, after "settlement charges" and "deposits." The minutes are posted on the parish's Web site. According to the minutes, 5 percent of the parish's profit from the sale will go to local charities. It wasn't known today what the sale would mean for the possibility of expansion of the church's cemetery services or how the parish will use the remaining proceeds from the sale. During the Sept. 20 meeting, Deacon Alexander Saunders, a parish finance council representative, told pastoral council members that the church's weekly collection revenue was down by $80,470 during the fiscal year that ended June 30. The church has been at the center of a controversy involving the Norwich diocese's treatment of a priest from Tanzania, who had been serving as a vicar in the parish since the mid-1990s. As a result of the dispute between the Rev. Justinian B. Rweyemamu and Norwich Bishop Michael R. Cote, some parishioners have said that they would withhold or reduce their donations to the parish. The pastoral council's minutes also indicate financial difficulties at St. Bernard School, which could lead to its closing. Last week, the council was scheduled to receive a presentation from the church's school board on a strategic plan for the school. During the September meeting, Valliere told the council that the school had only 67 students and that it was costing the parish more than $400,000 a year to keep it open. The school has operated in the Rockville section of town since May 1887. In an Oct. 14 letter to pastoral council members, posted on the church's Web site, Kenny urged members to be prepared to deal with the challenges facing the school. "Quite frankly, if, in the end, a recommendation has to be made to close our school, it should not be made without every parish institution leaving "no stone unturned' to continue a tradition of service and excellence that has served the Rockville community for 118 years," Kenny wrote. Valliere told the council that a decision about the school's future needs to be made by April. With the sale of the land complete, J.H. Scelza can now begin construction of the condominium complex, which will include 76 two-bedroom units in 19 buildings. A majority of the units are expected to feature two-car garages and driveways capable of parking two cars. The development is expected to contain parking for a total of 328 cars, which is significantly more than the town's requirement of 152 spaces. The project, which will be known as Bridlewood, has been described as an "upscale, luxury condominium project" with units selling for at least $250,000. During the Planning and Zoning Commission's public hearings on the project, Jacobs said the complex has the potential to add $13 million to the town's grand list of taxable property. Jacobs also said J.H. Scelza is willing to allow the town to establish a hiking trail on the property if attempts to locate one on nearby school or church property fail.